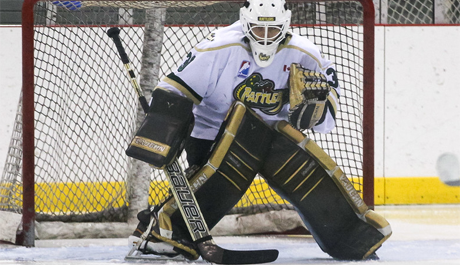 The Bradford Rattlers have re-signed star goaltender Bradley Hampton for the upcoming 2016-2017 season. Hampton, 19, was the starting goaltender last season, playing in 22 games for the Rattlers. Last season Hampton posted a 10-5-0 record with a GAA just over four. Bradley is a product of the prestigious Thunder Bay Kings AAA program. He was signed to the Rattlers after playing with the Kings in the OHL Cup. He also was the starting goalie for Team Northwestern Ontario in the 2013 Ontario U16 Championships. Due to his unorthodox style, Hampton was overlooked at the OHL draft. His compete level in the crease is what Rattlers management is likes most about Hampton's game: "He brings a high compete level to the team. The team feeds off that and steps up to play for him. He will be a big piece to this year's team." said GM Werth. Bradley received interest from NAHL & OJHL teams, but chose to resign in Bradford: "I wanted to come back to the Rattlers. It's good hockey, good organization, good coaching staff. I think management here will help me further my career in junior hockey."